Students at Rahn Elementary School of Arts and Technology in Eagan found their school invaded by Vikings on May 30. Thankfully, these Vikings were there to hand out backpacks with books and spend some time playing games with students both in classrooms and the gym. As part of the Minnesota Vikings first Team Up to Give Back community service day, more than 30 players were on hand at the school, including running back Latavius Murray, linebacker Anthony Barr and safety Andrew Sendejo. Some visited classrooms, squeezing their professional athlete-sized frames into first grader-sized chairs, to read, color, play games and chat with students. Others were active with students in the gym, playing games of tag and team relays. 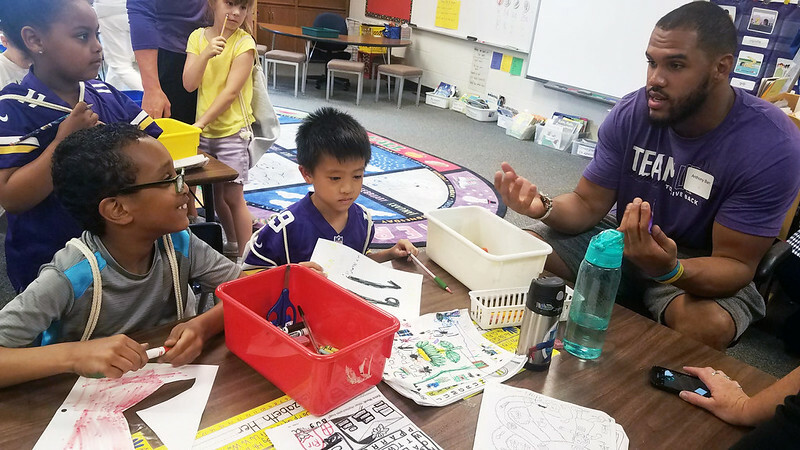 The community outreach effort actually kicked off the week before when Rahn third-grade students worked with artists to create pieces that will be installed at TCO Performance Center, the Vikings’ new training facility in Eagan. Read more about Team Up to Give Back at www.vikings.com/community. Photo at top: Vikings linebacker Anthony Barr talks with first graders during a visit on May 30.